This jewel-like memoir details her personal struggle against typhus fever, during which she gave birth to her second child, Luz, who had to be suckled by a nanny goat. As ever we are embraced by Juliette’s love of nature and animals, and welcomed onlookers as she relates with people whose lives are far different from ours. TO GET DOZENS OF NEW BONUS GIFTS FROM JULIETTE’S FRIENDS AND SUPPORTERS. Order Now from the Wise Woman Bookshop! Gypsies dance and sing their way through this book, adding their picturesque – and sometime threatening – energy to an exquisitely detailed story that is always intriguing, and sometimes suspenseful. Juliette shares with us the herbal lore she learned and used in the Spanish Sierra Nevada mountains. You’ll find herbs to combat vermin, counter burns, keep your skin beautiful, and many more. During the time I knew her, she lived in Israel, Greece, Germany, Switzerland, Mexico, and all over the United States. Her wanderings were always directed toward helping animals and learning about herbs. 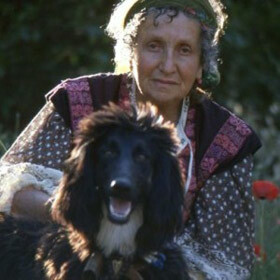 If you love either animals or plants, you will love Juliette de Bairacli Levy and her books." 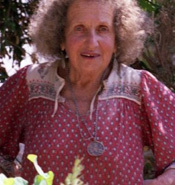 Juliette de Bairacli Levy is a world renowned herbalist, author, breeder of Afghan hounds, friend of the Gypsies, traveller in search of herbal wisdom, and the pioneer of holistic vetea href="http://www.wisewomanbookshop.com">www.wisewomanbookshop.com – on anything in the bookshop excluding registrations for events at Wise Woman Center and Wise Woman University. 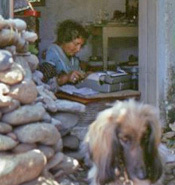 Juliette de Bairacli Levy is a world renowned herbalist, author, breeder of Afghan hounds, friend of the Gypsies, traveller in search of herbal wisdom, and the pioneer of holistic veterinary medicine. Juliette was born on the 11th hour of the 11th day of the 11th month in 1912 in Manchester, England.She was educated at Lowther College, one of the best girls schools in Britain, and went on to study veterinary medicine at the Universities of Manchester and Liverpool. Order Juliette’s book and Susun will also offer you a coupon for ten percent discount on any order at www.wisewomanbookshop.com – on anything in the bookshop excluding registrations for events at Wise Woman Center and Wise Woman University.